MINECRAFT 3" Action Figure Toy - Steve, Zombie, Creeper and more! The Walking Dead Shane Walsh with Cap Series 5 Action Figure New. Condition is New. Dispatched with Royal Mail 2nd Class. The Walking Dead Daryl and Merle Dixon Action Figure Double Pack New. Condition is New. Dispatched with Royal Mail 2nd Class. Funko vinyl - Walking Dead's Prison walker Visor is fully functional Been in glass cabinet for a few years. Great condition. CALL OF DUTY TOY BUNDLE. Here isResident Evil Archives Series 3 Crimson Head Zombie boxed includes. Very well looked after. Includes accessories - headphones, gun, alternate arm (not shown). Character: ZombiePackaging: Original (Unopened)Size: 7"
Toxic Crusaders Toxie Zombie figure retro vintage Playmates 1991. Condition is Used. Dispatched with Royal Mail 2nd Class. Box is also in good condition, with only slight denting but no tears. The Governor's Room set includes hardwood floors, two walls, light up base to illuminate nine fish tanks encasing walker heads, cage, leather chair, end table with lamp, two woven baskets and a bucket of body parts. 2009 Neca Capcom Resident Evil Video Game EXECUTIONER Zombie Action Figure Rare. Condition is Used and 1 of the nails has snapped off see pics so sold has seen Dispatched with Royal Mail 2nd Class. The unedited version is right next to it. In a used but good condition with signs of general playwear. In great condition as can be seen however the blister has some yellowing and has been re-attached to card. International postage is available via ebay global shipping scheme. Discount on postage for multiple items. Full price for first item and £1 per item after. International bidders wanting to combine shipping must contact us before purchase. Postage cannot be combined if this is not done. 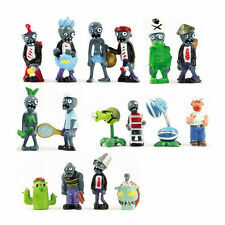 The Walking Dead - Zombie Money Bank (Colour). Condition is New. Dispatched with Royal Mail 1st Class. Description： Get the whole gang together with the Legends of Roblox pack. An amazing 3D world where you can let your imagination run wild, Roblox is the perfect place for being creative. You can design your own games, play ones made by others and go on adventures with your friends. With this pack, you get six of the greatest Roblox game creators of all time. Litozinnamon, Gusmanak, Merely, TheGamer101, Seranok and Loleris came up with unique experiences like Phantom Forces and Sword Fighting Tournament. This catapulted them to legendary status, and now they all come together as part of this heroic set. Ideal for legendary Robloxers aged 6 and up. ROBLOX Action Figures Perfect for any Roblox Fan Package Content:one set Figures. The set consists of the following characters. The Walking Dead Funko Pop.Tank Zombie #36 Rare and Vaulted .